Door blinds can be any blind or shade mounted as a door mount blind. French door blinds or traditional door blinds are simply outside mount blinds or shades with hold downs to keep them from swinging as the door opens or shuts. 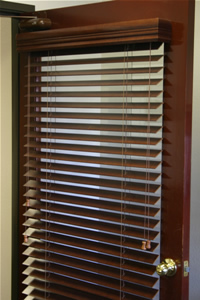 People commonly mount blinds in a door at their home or office. Popular blinds that are used on doors range from faux wood, wood, cellular shades and roller shades. When measuring for french door blinds there are several things to consider. Door Blinds are considered outside mount, that is they are not going into a recess, rather they are going to fit on the exterior of the door. Since you will be ordering an outside mount window blind, the first thing to remember is that the measurement that you provide will come EXACTLY the width and length given. To get started simply measure the width and length of the glass, If you have raised moulding around the glass that you wish to cover measure from the outside of the the moulding edge to outside edge width and length. A great rule to remember is to add at least an inch to the width and at least three or four inches to the length of the door mount blind. This will provide you with extra blind width and length to provide added privacy and installation space. Don't add too much to the width of the measurement so that it interferes with door handles or any locks. Make sure to select outside mount instead of the inside mount option when ordering the french door blinds. We recommend having the tilt and lift controls on the blinds to be on the side next to the door hinges away from the handle. This helps prevent the controls from getting shut in the door when opening and closing. For doors that have lever type handles remember that our 2 or 2 1/2 inch blinds will work but the handle can interfere with the tilting of the blind slats. However when closed they will fit behind the lever. To tilt the french door blinds open simply move the slats that are in the way from behind the lever. We provide spacer brackets and hold down brackets with the door blinds so there is no need to request them. The hold down brackets help to keep the blind in place and prevent the blind or shade from swinging back and forth. The spacer brackets are used with doors that have raised moulding around the glass. That's all there is to it! Simply pick your color and once again make sure that you have selected an outside mount and your done! Measuring and installing french door blinds or traditional door blinds is that easy. We have also embedded a video that walks you through basic measuring techniques. As always please feel free to call us with any questions you might have.